Cover: Ken Mitchroney, Ryan Brown, "Martin"
Man Ray drops the Turtles and April off at a New Orleans train yard and leaves to investigate some strange meteors that landed in the ocean (which are, in reality, a part of Queen Maligna’s invading forces). The Turtles and April sneak onto the roof of a cargo train and ride the rails back to New York City, hobo-style (decrying the pollution caused by New Jersey oil refineries along the way…ugh). Arriving in the sewers, they trudge their way back to the Turtles’ lair. Their path leads them back to the subterranean entrance to “Saki Inc.”, the Shredder’s old hide-out, as well as the remains of the Foot Super Soldier that Mikey pummeled. They’re caught off guard by the sound of hair metal coming from Shredder’s old HQ and decide to go investigate. What they find is a teenage metal band called Merciless Slaughter, with their front man being a guy named Mondo (with his pet gecko latched onto his shoulder). As Mondo’s girlfriend, Candy, compliments the band’s latest practice session, Mondo decides to impress her by copying a move he saw Dave Mustaine perform in a video. The result is massive feedback that blows out the power grid. When the lights come back on, the Merciless Slaughter find themselves surrounded by a horde of awakened Foot Soldiers who are ready to mercilessly slaughter them. The TMNT and April leap to their rescue as the teenagers make a break for it. Everything is going fine until a Foot Super Soldier steps out of the shadows. The Super Soldier grabs Candy and smacks Mondo into a pile of mutagen barrels. As the Super Soldier hightails it out of the sewers with Candy, Mondo mutates into an anthropomorphic gecko (due to his recently being in contact with his pet gecko). 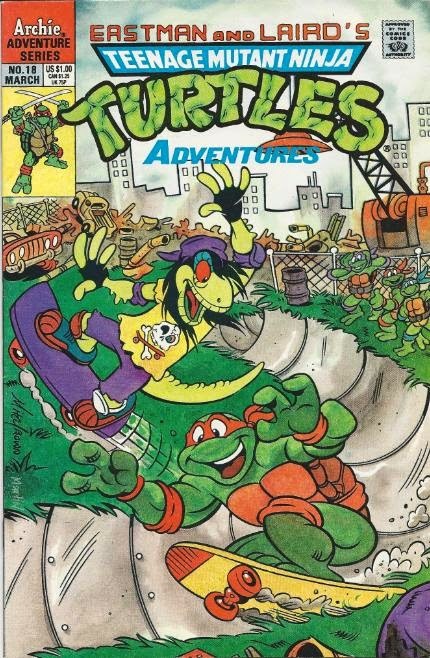 As April, Leo, Don and Raph take-out the last of the Foot Soldiers, Mikey and Mondo grab some skateboards and head after Candy. Sharing some friendly banter along the way, they reach the surface only to find the Super Soldier scaling the outside of a skyscraper that’s still under construction. Mondo tells Mikey to watch his board as he latches onto the side of the building, sticking to its surface and scaling it effortlessly. On the 20th floor, Mondo and the Super Soldier have their showdown. Mondo rides his skateboard up a ramp (despite the fact that he left it down on the ground a page ago) and slams into the Super Soldier, knocking the robot over the ledge and to its doom. Candy thanks Mondo for the rescue and then proceeds to break up with him because now he’s just too damn ugly (women…). The Turtles invite Mondo to come chill at their place until he works things out. They’re interrupted, however, by the sight of several more “meteors” hovering around Null’s skyscraper a few blocks away. Leo gives the mysterious situation a resounding “Whatever” and votes they all go home (that’s quality leadership for you). Back at the lair, they “surprise” Splinter (who senses their arrival a mile away) and a big group hug follows. 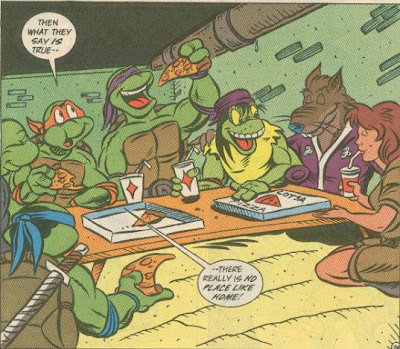 The Turtles, Splinter, April and Mondo then celebrate with a pizza. *This story is continued from TMNT Adventures #17. This story is continued in TMNT Adventures #19. *The TMNT fought the first Foot Super Soldier and visited Shredder’s old HQ in TMNT Adventures #11. *Shredder was imprisoned and the Sons of Silence were banished in TMNT Adventures # 13. *Candy Fine (Mondo's girlfriend) will return in Merdude and Mondo Gecko #2. *According to the letters page in TMNT Adventures #47, Mondo's pet gecko, Bongo, will be left in the care of Splinter after this issue. You know, in case you were worried about him. *This issue was published in the UK by Fleetway in TMHT Adventures #30. The South American tour arc may be over, but this issue acts as its epilogue, giving us a bit of a breather before the next major arc (Queen Maligna’s invasion and the birth of the Mighty Mutanimals) gets underway. And being the epilogue to the South American tour arc, you can expect some in-your-face environmentalist preaching. Thankfully, Clarrain (Murphy) scales it back to a brief finger-wagging at New Jersey oil refineries and some seriously lame lyrics in Merciless Slaughter’s song (again, attacking “Big Oil”). Oh well. And speaking of Merciless Slaughter, Clarrain tries something funny with this issue. Their music is represented by the actual notes transcribed in-between the panels alongside Mondo’s lyrics. I am tone deaf and completely incapable of reading sheet music, but since they hired some guy named Dan Edwards to transcribe the music for them, I trust it’s legit. Anyhow, I love metal. I eat and breathe it. 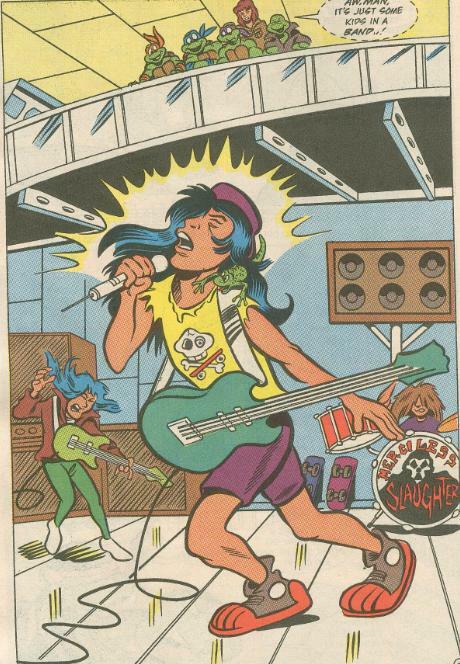 One thing that I’ve loved about the TMNT in comic book form is that they always cram in as many nods to metal bands as possible, usually via t-shirts, posters and grafitti. 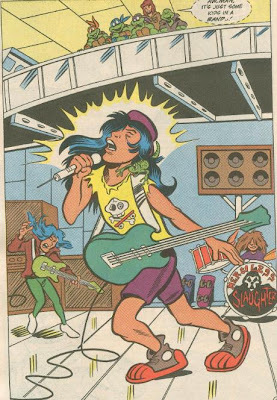 You’ll find references to Anthrax, Metallica, Megadeth and Sepultura (just to name a few) throughout both the Mirage and Archie universes. As a matter of fact, I have a print drawn by Ryan Brown of Raph in a Metallica t-shirt, hoisting a guitar over his shoulder and waving his metal fingers framed and hung on my wall. It’s just that sweet. Like a lot of the Archie interpretations of supporting characters, Mondo Gecko features an origin vastly different from the one seen in the Fred Wolf cartoon. 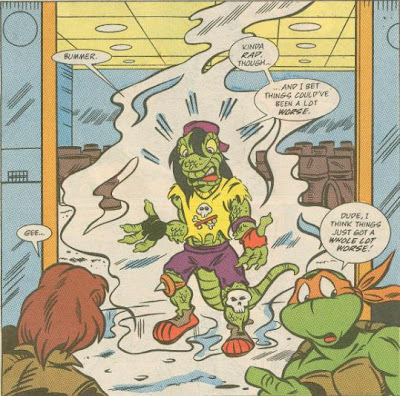 In the episode “Michaelangelo Meets Mondo Gecko”, it was revealed that Mondo was a normal gecko that was with the Turtles when they were splashed with mutagen, in a sense making him their “brother”. However, while the Turtles were found by Splinter, he was found and taken away by a con artist and raised into a life of crime (before Mikey straightened him out and they became best buds). While I usually unanimously prefer the Archie interpretation of most characters, I like bits of both origins. Still, Mondo’s origin as presented here was pretty fun, tying in with what we’d seen in an earlier issue. And hey, after having the likes of Jagwar and Dreadmon pop up out of the blue with no background whatsoever, perhaps we should all just be happy that Mondo Gecko even got an origin. Overall, some lame preaching about “Big Oil” aside, this was a good issue, introducing us to one of my favorite members of the Mighty Mutanimals. Those skateboards were leaning against the wall when the band was practicing.